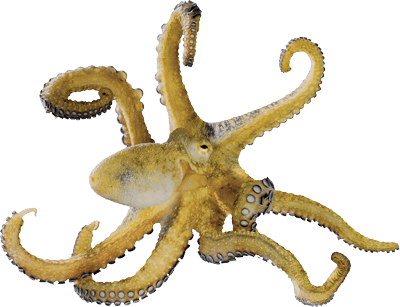 Octopuses are thought to have been alive when the dinosaurs still walked the earth. They have three hearts - two move blood over the gills, and one to move blood though the body. An octopus' blood is blue because it is copper-based, not iron-based. Print the Octopus Character Card! 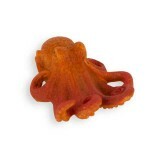 Octopuses will collect crustacean shells and other objects to construct fortresses, or "gardens," around their lairs. An Octopuses line of defense is its ability to hide in plain sight. Using a network of pigment cells and specialized muscles in its skin, the common octopus can almost instantaneously match the colors, patterns, and even textures of its surroundings. When discovered, an octopus will release a cloud of black ink to obscure its attacker's view, giving it time to swim away. An Octopus can lose an arm to escape a predator's grasp and regrow it later with no permanent damage.